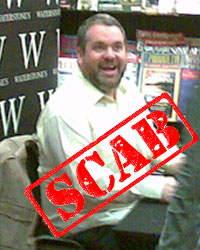 Spectacularly tedious radio 'personality' Chris Moyles crossed the picket lines of his colleagues during the 2011 BBC strike against compulsory redundancies. 2005 BBC strike against 4,000 job cuts. This should come as no surprise, as Moyles has a history of scabbing, when he crossed picket lines during the 2005 BBC strike against 4,000 job cuts.Ignoring the wishes of his workmates, Moyles - who just one month earlier had recieved a £630,000 a year pay deal - presented his Radio One breakfast show as usual. Moyles also struck controversy by racially offending actress Halle Berry. It would have been great if things like this were made for this weekend's strike.